The Intel Atom Z2760 is a SoC (System on a Chip) with the Codename Cloverview and part of the Clovertrail platform. 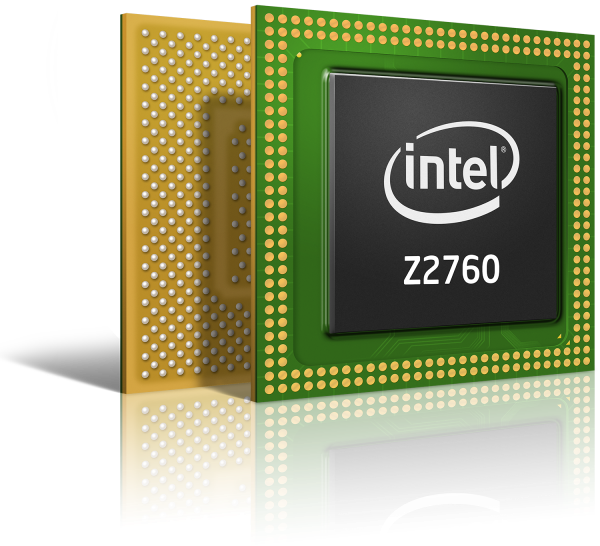 The Z2760 is a one chip SoC and integrates a dual core Atom processor clocked at max. 1.8 GHz. Due to Hyper-Threading, 4 threads can be executed on the two cores (for improved efficiency). Altough the Atom cores theoretically support 64 Bit, the Z2760 is only specified for 32 Bit operating systems. The processor performance is on a level with other dual core Atom processors at 1.8 GHz as the Atom D525. Therefore, demanding tasks like HD video cutting is too much for the slow CPU cores. According to the Geekbench results, the Atom Z2760 in Windows 8 tablets offers a similar performance than a fast Tegra 3 or a OMAP 4470 with two 1.5 GHz Cortex-A9 cores. The integrated graphics card is based on a PowerVR SGX 545 (DirectX 9_3 support) design and clocked at 533 MHz. The video decoder and encoder also stem from Imagination Technologies. Furthermore, a dual channel LPDDR2 memory controller for a maximum of 2 GB RAM is integrated. The whole SoC was optimized for power efficiency and low power consumption. It is produced with a 32nm LP (low power) process. Therefore, the power consumtion is in the same league as some ARM SoCs like the Tegra 3 and passive cooling is possible. The TDP ranges between 1.7 and 3 Watt (e.g. at techpowerup) depending on the source. The Intel Atom Z2560 is a SoC (System on a Chip) with the Codename Penwell and part of the Medfield platform. 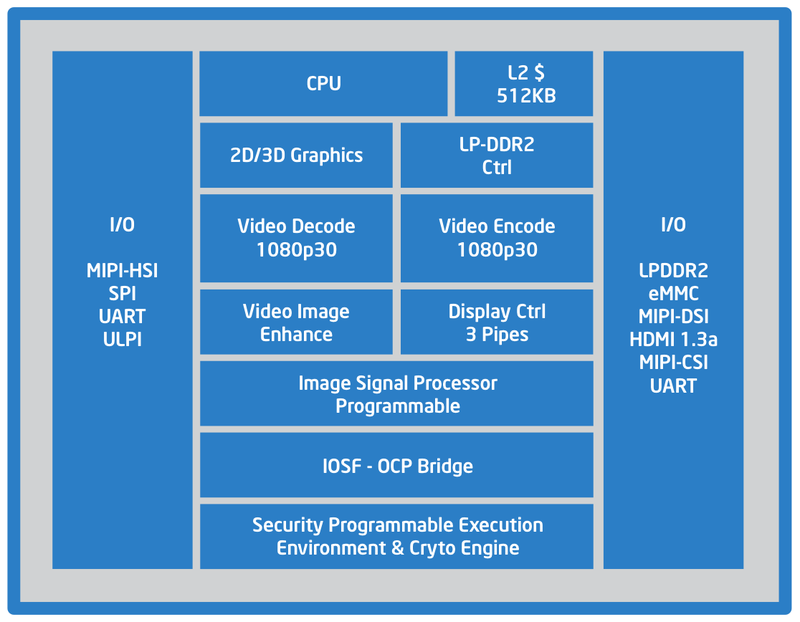 The Z2560 is a one chip SoC and integrates a dual core Atom processor (Saltwell) clocked at 933 - 1600 MHz. Due to Hyper-Threading, 4 threads can be executed on the two cores (for improved efficiency). The Saltwell CPU core is still very similar to the first Intel Atom. Therefore, the performance per clock should be very similar (only very small enhancements). However, the CPU now features additional 256 KB low-power-cache (on a separate voltage plane) to allow the CPU and L2 cache to enter a lower power state. Furthermore, the Atom now supports some sort of Turbo Boost and can reach up to 1.6 GHz shortly (933 MHz base frequency). Furthermore, the CPU core can be downclocked to 100 MHz (in 100 MHz steps) to save power. The processor performance should be on a level with a previous generation Atom processor clocked at 933 - 1600 MHz (e.g., the Atom N550 clocked at 1.5 GHz). Therefore, the Z2560 should be a mid-range smartphone/tablet SoC. The integrated graphics card is based on a PowerVR SGX 544MP2 design and clocked at 400 MHz. The video decoder (MPEG4.2, H.264, VC1, WMV) and encoder (MPEG4.2, H.264) also stem from Imagination Technologies (VDX385 and VDE285) and should allow 1080p30 de- and encoding of videos. The whole SoC was optimized for power efficiency and low power consumption. It is produced with a 32nm LP (low power) process and has a TDP of 3 Watt (according to TechPowerUp). Therefore, the Z2560 is even suited for smartphones.